Search US Businesses with the Company Lookup Tool by NAICS Association. 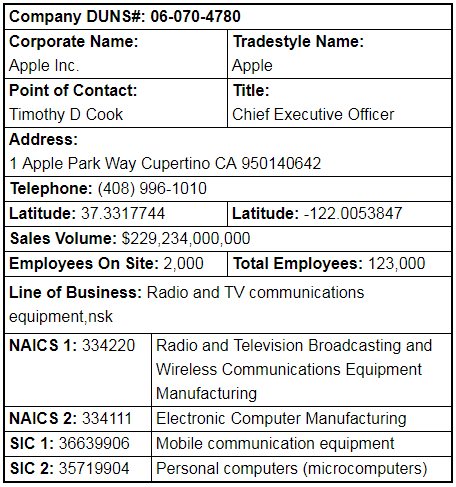 Identify NAICS and SIC Codes and Descriptions, DUNS Numbers, Annual Sales, Total Number of Employees and Employees On-Site, Address and Phone Information, Contact Names, Line of Business and More. Require Multiple Lookups? Subscribe for Substantial Bulk Savings! • Two NAICS Codes & Descr. • Two SIC Codes & Descr. Single Look-ups can be purchased for $9.95 per record. Search for a Business to select a single record for purchase. With The Company Lookup Tool, Hard to Obtain Information is Now Easy to Access! With Access to a database of over 19 Million US Business Locations, you can perform a Company Lookup to obtain NAICS and SIC Information, DUNS Numbers, Company Size Information, Addresses, Phone Numbers, Contact Names, Lat/Long and More in Just Seconds! Where once you would have to purchase an expensive company credit report or subscription to obtain these vital data points, now you can purchase the data you need to keep your client information accurate and up to date with vital, actionable data.